Tools needed: nothing special, just a socket set (10, 12, 13 and 19mm sockets -the 19mm is just needed for the big bolt into the motor) and some common Phillips screwdrivers (standard and large heads). I’d also recommend wearing leather gloves while doing the work on the machine since there are some sharp sheet metal bits in the interior. 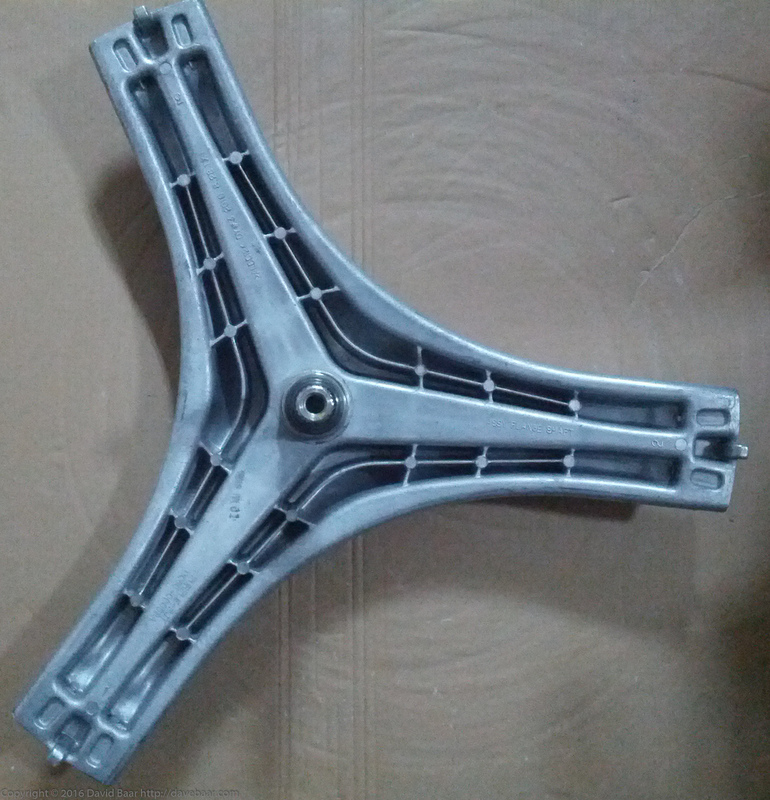 Cause: It turns out that the aluminum flange support (“spider”) corrodes rapidly in the presence of common laundry detergents, particularly ones that make the washing solution alkaline (“basic”, pH>7). After only about 5 years of use, one of the three arms of the spider had broken off completely. 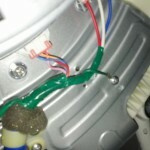 Apparently this corrosion can be reduced by rinsing the machine with plain hot water or a slightly acidic solution (e.g. add some vinegar) regularly, e.g. once a month, to get the basic detergent residue cleared away. The Repair: Refer to the photos below for some details, especially for reassembly work to know where all the parts have to go back to. 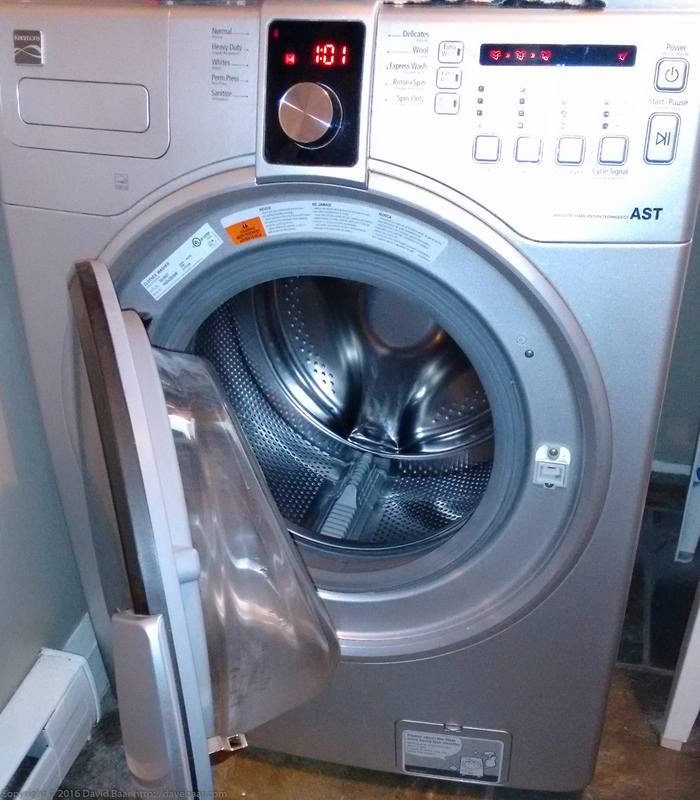 Ultimately, the big plastic washer tub containing the stainless steel spinner that the spider is bolted to, has to come out of the washer for external disassembly, but to have clearance for doing the tub removal, the top cover and and front upper covers, including control circuitry and the detergent dispenser have to be removed first. 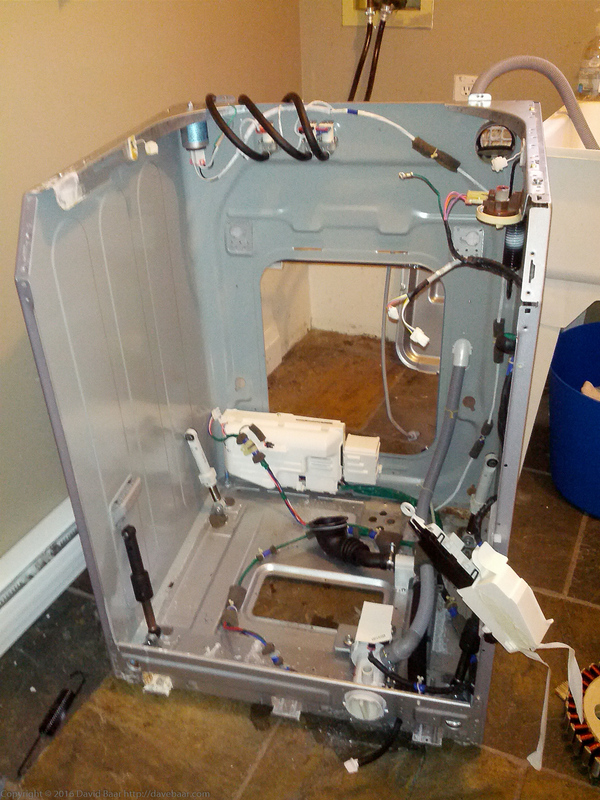 Finally, the large lower front panel with the washer door needs to be removed. 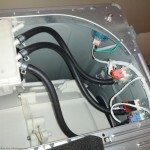 That requires removal of 2 clamping rings around the soft door gasket, then careful disconnection of the gasket itself from the tub. There are also 2 crossbars, one that goes front-to-back down the middle of the top of the machine, and another that runs across the front that need to be removed. 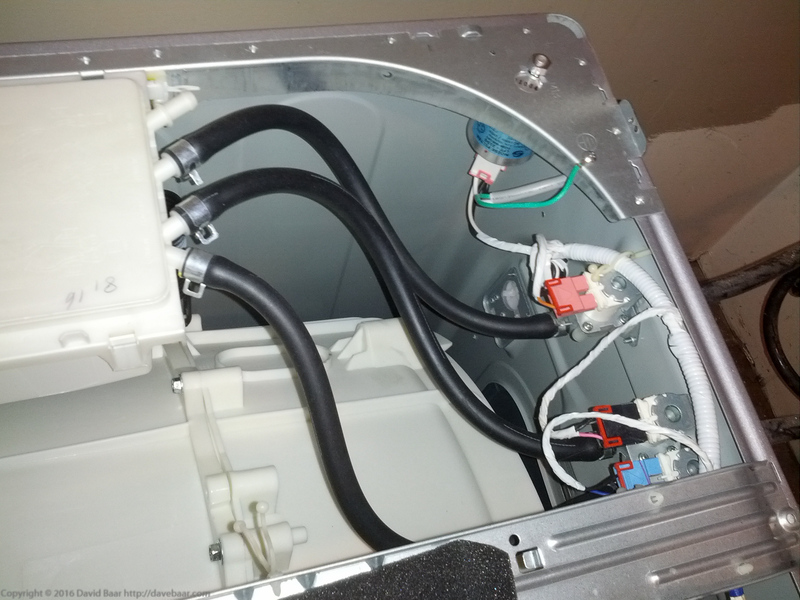 Once those parts are out, there are intake and drain hoses that need to be removed from the tub. 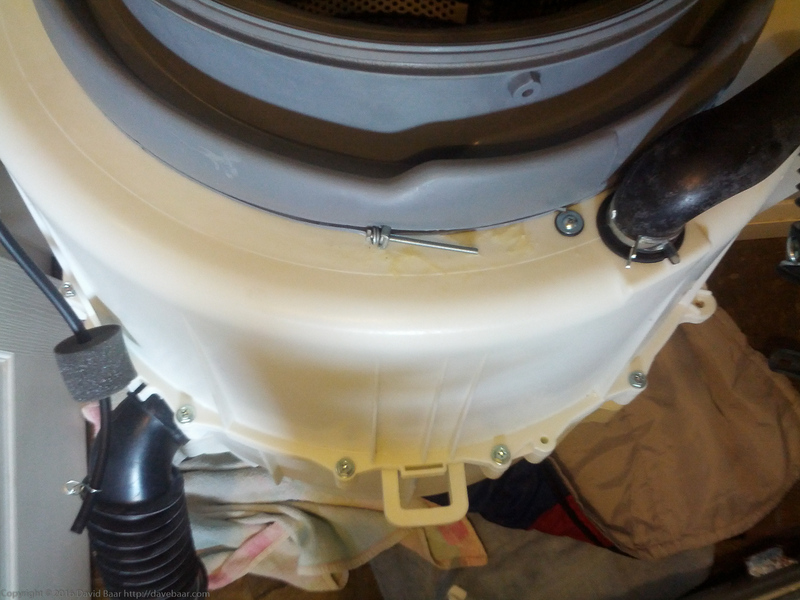 Next, the 4 shock absorbers at the bottom of the tub need to be disconnected from the tub, by removing the large bolts at the tub side. That will leave the tub suspended in the washing machine frame by 2 large springs, one on each side. With the help of a strong assistant, you should be able to lift the tub and detach the springs. Careful with this; the tub unit is pretty heavy. Once you get the tub out of the machine, put it on a cushioned floor area to prevent damage, with a lot of space around for you to work in. With the tub front facing down, unbolt the motor central bolt (19mm socket, I think) and gently but firmly remove the motor casing from the tub back, and put it aside. 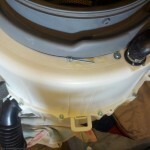 Carefully remove the large self-tapping bolts (about a dozen) holding the front and back halves of the tub together. Pull the back of the tub off. That should expose the inner spinner and the spider. You’ll next need to remove the broken spider by taking out 6, 8mm bolts (2 per spider arm). You’ll probably find a lot of badly corroded aluminum pieces that have broken off the spider. Clean those up thoroughly and get them out of the drum before you continue with the repair. Finally, bolt the replacement spider in, and reverse the above steps to put the thing back together. It took about 3 weeks for me to get the replacement spider shipped to me. Fortunately, our kind neighbour Klari, who has a newer version of almost the same washer, lent us the use of hers in the meantime -big thanks to Klari for that. It took me a few minutes to bolt the replacement spider in, and then a couple of hours to reassemble the machine. Success! It actually works fine after the repair. This was a relatively easy repair, just with a lot of parts to take out before one can get at the broken component.Front load washers can have certain advantages over top-loading alternatives such as reduced water usage, but this design flaw is worth being aware of. Dave: Thanks the for the how to, followed it to the same conclusion you did. I wanted to add that in disassembling the washer I found what looked like rocks in the filter on the front, which turned out to be pieces of the disintegrating spider. Anyone thinking they may have this same situation should take a look in the strainer, there may be proof there that it is the spider, rather than shocks, broken weights,or whatever else might also be suspect. Thanks for your comment. Good point. Completely agree; I meant to add a note in the how-to about chunks in the strainer; that is exactly what I observed too! Hi, I had the same problem! Opened it up (lots of screws and parts) only to find that the spider flange was totally corroded, along with the 6 bolts holding it to the drum. The inner portion of the plastic drum was also badly damaged, as well as the soft door gasket. Instead of repair, we’ve decided to buy a new washing machine (a Samsung one actually). We are hoping that this spider flange corroding is an isolated incident for this Kenmore 592-49057 washing machine. Just curious, how has your replacement spider flange held up thus far? Was there any other damage to the machine? Did you have to get replacement bolts since they were probably corroded along with the spider flange? 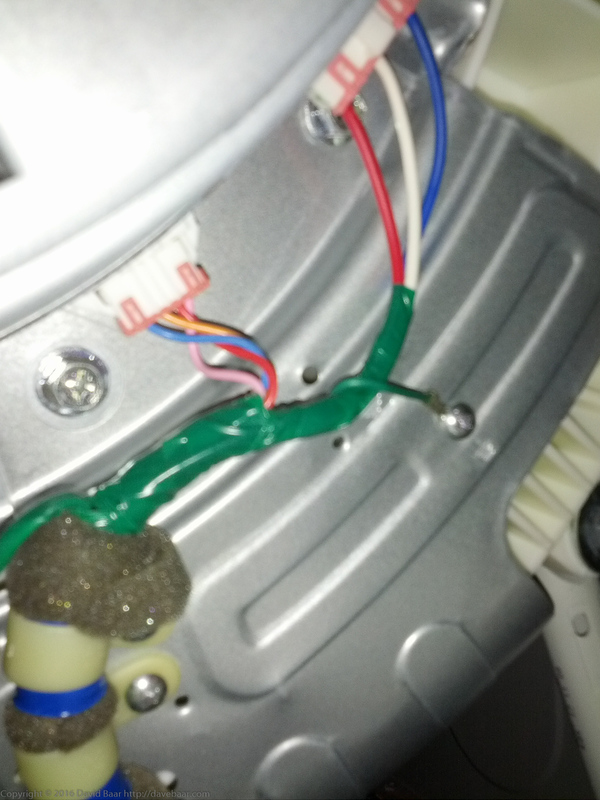 Also, do you know the corresponding model number for the Samsung for this Kenmore 592-49057 washing machine? Samsung 59249057 does not pull up any search results. Thanks for your very helpful how-to! You’re welcome. In our case, we were somewhat lucky that the broken spider didn’t cause any other damage to the machine; maybe in our case we just caught the problem in time. So far the replacement spider has held up for a year. We switched over to liquid detergent, and also run the machine with hot water and no detergent once in a while, to clear it out. 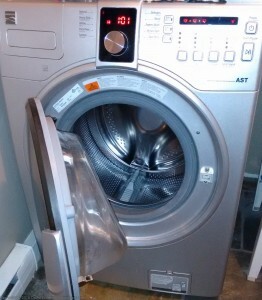 I suspect that the same problem will happen with many front load washers using similar designs and an aluminum spider. Dave thanks for this info and anyone else that did this project what was the approximate time it took to complete this project? Hi, Josh. You’re welcome. I figure I spent about half a day on the project in total, but a lot of that was exploration; I didn’t initially know what the problem was, and I’d never taken apart a similar washer before. I think if I had to do it again I could do the same repair in <2 hours. Thanks Dave i will let you know how it goes. I got mine off a site for $211 with shipping included (https://www.reliableparts.ca) Just in case someone needs a link. I needed it quickly so I couldnt wait too long, but it arrived in a few days. I hope that’s the issue though, we will see once i get it apart. All the issues you explain are the exact same ones i have. Dave/ Mine is making the same thumping sound and had a service person in to see what the problem was. He is a trusted repair person as we have used him for over 25 years. 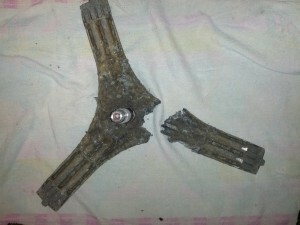 He told me that the bearings were shot and that the shaft could be damaged also. He said the only fix was a complete drum unit which is expensive. I had the same problem finding any parts as the model number doesn’t show up in any search. What would be your recommendation as we have the dryer staked on top. He recommended selling the dryer and giving the washer away and purchasing all new. He said this was a chronic problem with this model. Dave, did the repair person actually take your washer apart and see a non-broken spider? If not, I would not be convinced of his conclusion given the documented spider failures here and elsewhere. I also suspect he is storytelling re “chronic problem”; we know for sure what one of the chronic problems with this model is, from the posts here, and that one is not failed bearings. From what you have said so far, the cause of the problem remains unknown. One symptom of a failed or failing spider that you should look for, as other commenters here have noted, is bits of oxidized aluminum in the strainer filter for the washer drain, which you usually can access from a small door at front of the washer. The bits will typically look like small rocks. If you find those, expect the spider to be the problem, not the bearings. As for the model number, what is that, from e.g. the nameplate on your machine? It’s a rare case these days that parts aren’t pretty easy to find, as was the case for mine and many others. If you are thinking about junking it anyway, then why not take it apart yourself and have a look? Unplug it first for safety if you do. Purchasing new at this point and junking the potentially repairable machine just seems to be giving up too easily, and does not match the theme of this blog. So after a couple days of repairing the spider arm (Kids making the job that much longer). It was a SUCCESS, it is so quiet now. I cant thank you enough for this post Dave. I found a couple videos showing how the repair is done, which i found a lot easier to follow(No offence Dave). Visually seeing it is always better for me. The one i watched was for a Samsung but it is all basically the same just a few different parts. Also just a change from what you did is to take off the stator before removing the tub it will make it a lot lighter for you to do it by yourself. Also dont forget to have some blue loctite on hand for some of the bolts like the weights bolt and the stabilizer arms. Anyhow Like the admin said you have nothing to lose by opening it up and seeing if it is the arm. But if your drain has pieces of metal in it most likely this is the issue. My arm was a mess when i took it out and broke into pieces. Again thanks so much it saved me 800 bucks. You’re welcome, Josh. Very glad you got yours fixed successfully. I sometimes consider doing video too; I actually like state-by-state pics for details as the minimum, but maybe I’ll do video + photo for more complex future repair writeups. Barb, I don’t have a parts list, but I think that if you google “samsung 59249057″ you’ll get a lot of results for parts and parts suppliers as well as downloads of manuals. You probably can find what you need there (I’m trying to stay independent of the parts providers so I can’t really recommend any particular one of them). Alibaba.com and ebay.com are also sometimes sources of parts for my repairs. Also, the inlet valve is probably a pretty standard solenoid-driven valve, and you might find part numbers on it that you can search on and find replacement/substitute for. Barb, also try searching on “samsung 59249057 inlet valve”. That actually got me direct links to the part and also a youtube video showing the replacement of it. 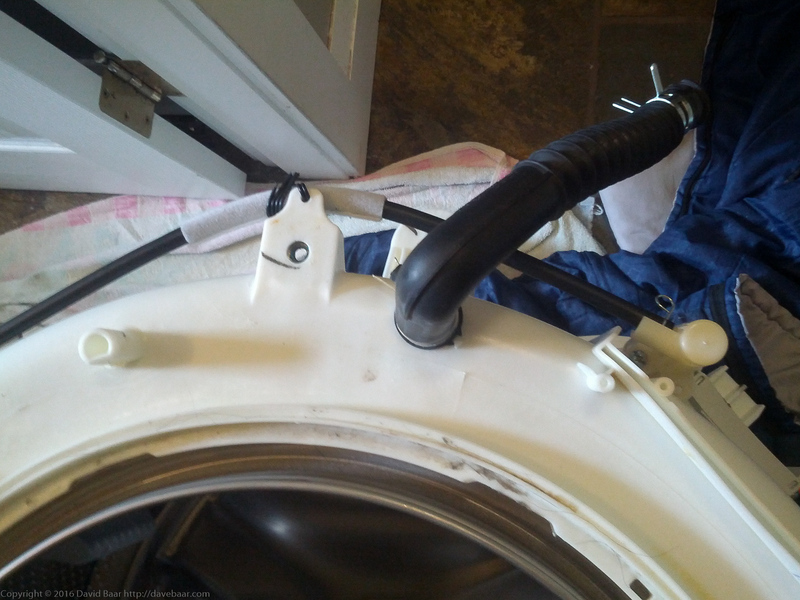 The spider flange on our samsung washing machine (purchased in late 2010) just gave out. The repair tech who visited advised that it was not worth fixing (without even removing a single screw!) because at the age of our machine ~approx 7 years old, there would likely be problems with other parts needing replacement or failing soon (i.e. shaft bearing, outer tub seal, etc.) -which would make the repairing the spider impractical. Based on the number of videos and online repair advice about failed spiders, it doesn’t seem that there commonly other complications. Does anyone have experience with this? 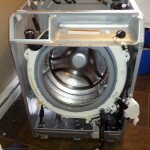 Hi, Dave N. The washing machine that is the subject of this repair blog post was of similar age to yours at time of repair. Since the spider repair in 2016, the machine has been used extensively, and no other parts have failed. It is still working great. Notably, the spider failure is a result of a weakness from corrosion that looks to be fairly specific to that part. There have been no issues with bearings whatsoever. Tub seal is still fine. Nowadays, you can find replacement parts for just about anything readily online, so if anything else does fail later, if you do this spider repair yourself, you’ll know for future how to tackle almost any other problem with the machine -since you will have already had to learn how to take most of the machine apart to replace the spider! Parts cost in Canada for the spider was <$150 with shipping in my case. Other than requiring some disassembly and assembly time, the spider replacement job is not particularly difficult and can be done with standard tools such as a common socket set. If you have those tools and some basic skills for using them, I encourage you to give this repair a try. You'll prevent one large machine from going into lossy recycling, or worse, landfill, and save yourself several hundred dollars in not having to buy a new machine. Great website – thank you! Between this and another repair video for a different machine (https://youtu.be/iFXp2X99mQs) I managed to take it apart and find a clogged, corroded and cracked spider. I wish I could upload my photo because it looks to me like they make these grooves in it to trap even more detergent residue for greater corroding power! Although our machine had a good run from 2009, with all the washing with two young kids. Good news is that we caught it early and the tub is in good shape (only minor surface scratches from the imbalance). My question to you is if you bought a new o-ring to reseal the tub halves? Mine looks OK so I was thinking of a wipe down, then some fresh silicone (?) and just put everything back together (I took photos as I went along and labelled screws and bolts in little zip lock baggies). Did you hand tighten all the bolts? Any other advice in greasing/sealing/tightening things when putting it back together? Finally, the diaphragm has a bunch of white grease on it. I can’t think of a function for that much grease smeared all over the diaphragm, not just where the tightening rings are. It’s facing the inside of the machine of course, so it’s only irritating to handle and not transferring to clothes. Would you bother cleaning or leave? Hi, Aldona. You’re welcome. I re-used the original o-ring for the tub halves. For re-greasing the o-ring, I wore nitrile gloves and wiped the grease on with the gloves, rather than use a potentially dust-carrying cloth (experience from years of vacuum systems in the world of experimental Physics). Yes, I hand-tightened the bolts, using a socket wrench. I re-applied Loctite on the ones that plainly appeared to have it previously. You can get that stuff at most hardware stores. Sorry but I can’t remember the grease on the diaphragm. It’s a few years now since I did this repair. I think I’d just leave it there. I have been searching for two weeks, while the washer is dismantled, for a spider arm and the front part of the plastic outer tub (got long cuts in it along the wall of the tub that you can see right through). I got a door gasket which was damaged and I thought it was causing the washer to spin endlessly during the spin cycle. 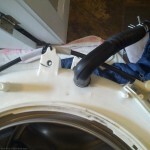 Long story short, I need a new spider arm and a front tub for the washer (Model # 592-49087). Can anyone help me, please. And thank you for this forum. 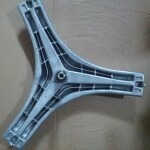 The part # for the front outer tub is DC61-02268A. Hi. There are several part numbers for the spider arm for the Kenmore Elite. Are these spiders all different in sizes, or are they able to fit onto a specific tub? It’s so confusing!!! Lorraine, yes, spiders do come in many sizes. However, one of the key points in the original post is that the machine isn’t really a Kenmore Elite. It’s a Samsung of the same model number, with Kenmore branding crudely pasted onto it. (Kenmore really doesn’t exist as a real manufacturer). Googling on Samsung 592-49087 spider can find you that a replacement spider part number #DC97-14875B should work. Great instructions Dave, thank you. I’ve got the same problem- severely coroded spider, full of holes and cracks. To say that this is a design flaw is an understatement! Any boater or grade 9 science student for that matter knows the destructive effects of passing water quickly over cast aluminum, hence sacrificial catholic protection on all outdrives and out board boat motors that need to be replaced yearly.. That spider didn’t stand a chance! Mine has 2011/10/18 stamped on it and that’s about the time I purchased it. 6 years and they self destruct. Nice! Hi Dave, this is great, it helped me a lot and answered a lot of questions. I’ve had clunking for a little while now and checked my filter to find the granules in there so I’m going to rip it open and confirm the spider arm is broken before ordering a new one. A couple questions I have for others who have been through this now – did people purchase new spider bolts when they got new parts? And I’ve read elsewhere about someone priming and painting the new spider arm with some heavy duty paint to keep it from corroding again – did others consider this and why/who not? Finally, has anyone reported this to Samsung in Canada before? I chatted with them yesterday about my model WF340ANG XAC 03 and they said there were no reports on it, which seems odd. Mine is just over 6 years old. Thanks for your story. I’ve had those small rocks in the filter for some time and I suspected that my kids had these in their pocket when we washed their clothes. The washer kept working for a long period but died last week. After reading your story, I dismantled the thing, just to find a completely disintegrated spider. Apparently, this part is easy to find in Canada, so I should be able to rebuilt it tomorrow. Thanks because you save me many hours trying to figure what was wrong. Hi, Kendall. As for heavy duty paint, that’s a good idea in principle but I think you might have a hard time finding any easily-applied paint for aluminum that will hold up to many washing machine cycles, and I’d also be worried about any toxic paint getting washed into clothing. Anodization coating might work but most folks won’t have the capability for doing that. Perhaps something for the spider manufacturer to consider. Now that enough people have reported similar problems here on this blog, I think it is time for me to inform Samsung of the problem, so I will do that. Rejean, you’re very welcome. 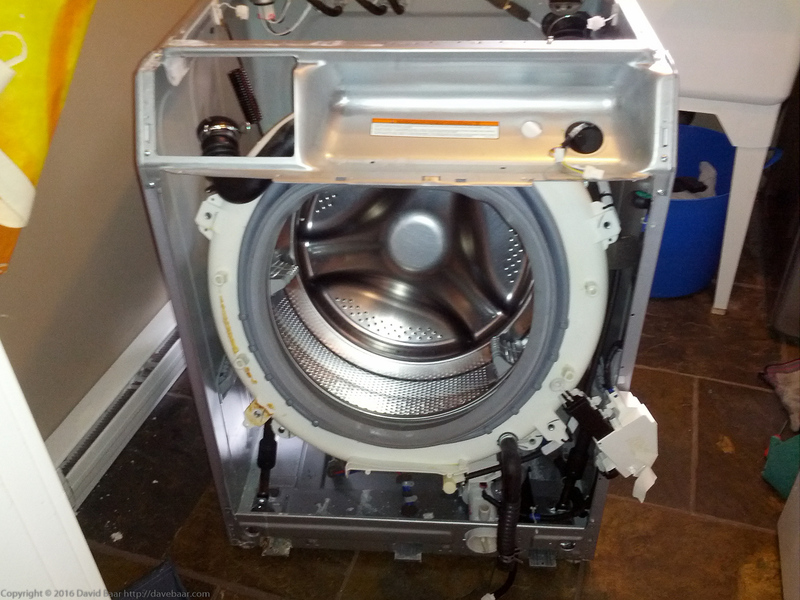 Always happy to save someone else time and money in repair, and in some cases even save an appliance from becoming junk. I also have the problem of the machine vibrating and shaking when the spin cycle starts to get a little faster. This causes the spin cycle to stop. Time to take it apart and see what is going on. 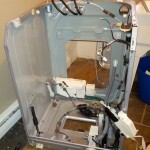 I had an older Kenmore with the same broke spider arm issue – but on that machine (made my Electrolux) a separate spider arm could not be purchased unlike the Samsung and the whole drum had to be purchased for >$300. A common problem with these washers as I have found. I tried making a replacement spider from steel but getting it precisely balanced was a real problem so that didn’t work out as I had hoped – but it was fun. It ran fine but shook a bit during the high speed spin. While the tub is apart, probably a good idea to replace the bearings and seal as well. These are generally available at bearing supply houses. There is a number stamped on the bearings if you look hard and best to change while the machine is all apart. I find the same problems, i saw the little pieces of looks like rock. With months more and more vibration. Before removing each of the pieces to find the problem of the spider, the clothes was getting wet because the washer could not turn fast enough. Here I am waiting for the room before going back after scrupulously cleaning the tank and all other parts. Thank you. Dave, I got the machine fixed with the new parts but now it will not start. Showing some “tE’ and beeps…. Too bad because I just spent over $300 on the new parts. Thank you for all your insights. What is the effect of spider weight on DC motor.how we calculate the spider weight.if spider weight two times than actual weight what its reaction.its a washing machine drum spider.